It is with great misplaced pride that I report that I am the first Kotaku writer to suffer from a dead Microsoft Kinect. 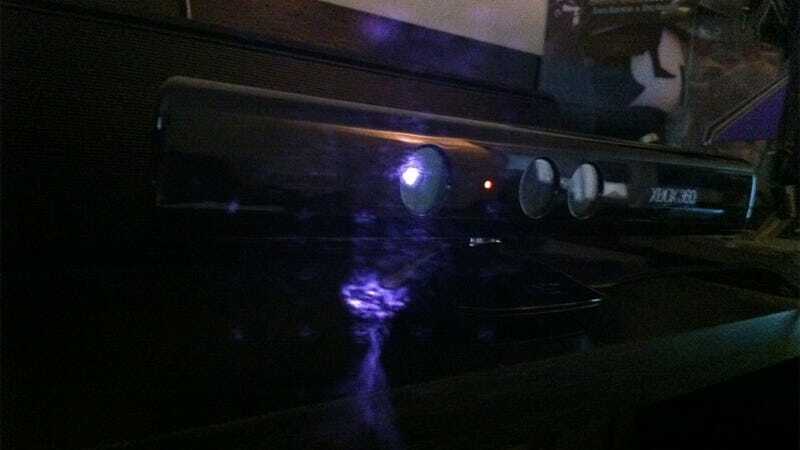 Also, it's incredibly difficult to get a close-up picture of the Kinect with the sensor powered on. All things considered, I've had rather good luck with my video game consoles as far as breaking goes. I've had to send my PlayStation 3 in once, then replaced it when it died again, and my Wii exploded on me a couple of years back, but all in all I've been blessed with resilient machines. Now I can't play Dance Central for several weeks, and my Kinectimal kitten might die of neglect. The green light on my Kinect sensor has turned to red, my attempts to calibrate it greeted with a "The Kinect Sensor is not level" error message. It's still sitting in the same place it's been sitting in since I bought it, watching over my living room like an extremely limited evil robot sentry. When I walk past it, it still wakes my Xbox 360 from sleep, but something inside of it has died. It moves no more. I tried various potential fixes I found on the internet. I moved it, unplugged it, let it cool down, let it warm up. When I finally gave up and went to Microsoft's support site, my error was one of the multiple choice options for reasons the Kinect isn't working, so it can't be a rare instance. So my Kinect is being shipped off for repair today. Dance Central and Kinectimals will have to wait until my new evil sentry robot arrives. So who else has had their Kinect die horribly?